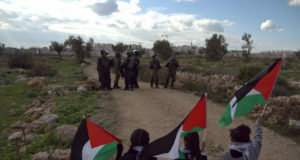 Three demonstrators were injured by rubber bullets in another of the weekly non-violent demonstrations against the Apartheid Wall and land grab in Bil’in village. A 29 year old American journalist was hit in the stomach, while two Palestinians from Bil’in took rubber bullets to the head and stomach respectively. 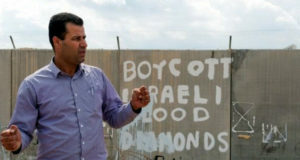 The Wall at Bil’in village, along with illegal Israeli settlements, has stolen nearly 60% of Bil’in residents’ vital agricultural land. As has happened for the last over 2 years, demonstrators amassed and left from the town centre, winding their way down the road towards the Wall. As with the previous Friday march, demonstrators were neither able to walk on their own land all the way to the wall nor free of showers of tear gas, sound bombs, and rubber bullets. 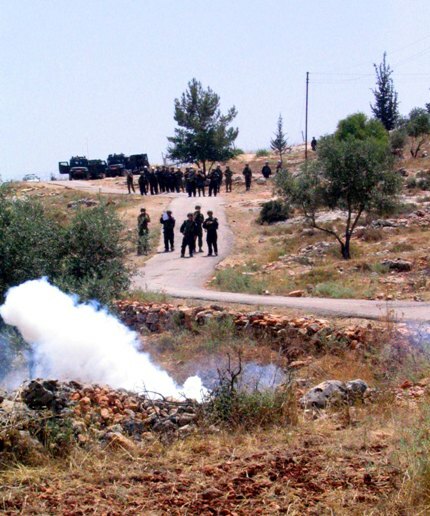 The Bil’in villagers’ weekly protest was again supported by international and Israeli solidarity activists, young and old, non-violent protesters, and the demonstration was again disrupted by tear gas canister-incited brush fires among the olive trees. Before the assault broke out from the waiting soldiers, protesters attempted to negotiate crossing the barbed barrier obstructing the road to the Wall. Having pushed aside the razor wire and crossed the line, soldiers soon after began their fire of gas, sound bombs, and later “rubber” bullets. The American wounded by a rubber bullet to the stomach was here in solidarity and to document first-hand the weekly incidences of violence against a non-violent protest, taking this valuable information back to young audiences in the U.S. “I want to tell the youths of America what is going on here. I present real material to them in a young voice, in a way they can understand. I want them to care, to be concerned about what is happening to our Palestinian friends,” he explained. In a community meeting centre, Abdullah, from the Bil’in Popular Committee, emptied sacks of sound bombs, empty tear gas canisters, and a mixture of rubber and live bullets into 2 large oil-barrel sized containers. “These are just from the last 2 demonstrations. 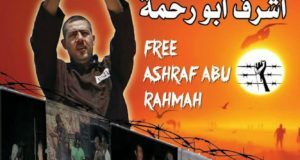 And they are only a portion of what was shot at the demonstrators at these protests,” recounted Abdullah. 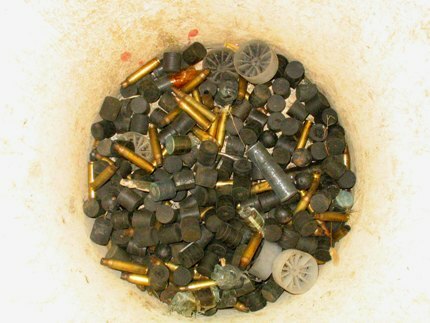 The rest have been either confiscated by the Israeli occupation forces or collected and sold for their aluminum value by Palestinian youths.